“Whatever happened with the messages in bottles? I am new to this blog – so the answer may be posted somewhere – but I’m not sure what direction to go to find it.” Asked Jean, several posts ago. As I read the question on my screen a single tear rolled down my cheek from my left eye. My right eye is somewhat lazy, not so prone to gratuitous displays of emotion and thus remained dry. I often think about the bottles and wonder if I should dust them down, discover what they were all about and follow the direction they were taking me. Even Charmaine is now burning with curiosity after she stumbled over them in a blog post way back in 2015. Thankfully her stumbling didn’t cause any breakages. No cuts. No grazes. No electrocutions. Perhaps it is time to publish some explanatory notes? Perhaps now that everyone has lost interest, now that everyone is fevered with the evils of politics and buffered by the occasional hurricane, perhaps now it is time to examine the bottles in more detail? Anyhow, it is something to ponder on…something to face. This entry was posted in Bottled and tagged bottled feeling, bottled revenge, the rundown to halloween on September 28, 2017 by Scarlet. I recall the bottles but not clearly. 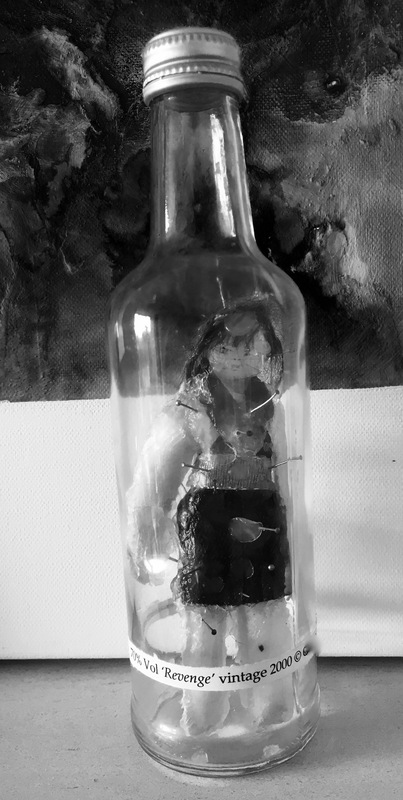 This voodoo doll in a bottle looks news to me. I ventured over to your sidebar (I do wonder how many blog reader even glance over there) and opened the link to “about the weird bottle stuff”. I gather you never scattered the bottles across the land. I sense this bottle decision bewilders you. Even your left and right eyes can’t agree. Here’s an idea – along with your art drop a twenty pound note in them and start a contest. “new” not news – I just finished reading the paper. Also my contest idea would be just one bottle. I don’t have a clue how many exists. Dear Bill!!! You are talking of the Bottle of Greed…. the bottle that is filled with family heirlooms, and trinkets, and possibly a matchbox. It is buried beneath a carpark in a place called Mogwash! I will find a link to the post that refers to this when I am feeling less befuddled. a matchbox – interesting – you know we still have a few of those around here. Are we sitting on a small fortune? Now we don’t really “sit” on the matchboxes since that would destroy them. You know the matchbox might be of more interest than the bottle. Oh yes, please. I’m all for bottles. Thank you cousin Batarde!! I hope you have studied the photograph… I am rather pleased with it. I have an embarrassing collection of bottles downstairs in my bin.I’d be happy to send them, but you’ll have to speak up sharpish as it’s bin day today. AKA the Day of Great Embarrassment When Dinah’s Bin is Emptied. But the postage fee would cost thousands, Dinah!! Think of the bubble wrap you would need! You will just have to order several cases of wine for me from a UK supplier… clear bottles only… And I will dispose of the contents. You know it makes sense. Oh, dear gods! Is that Black Shuck glowering behind the bottle?? You’ll need an industrial strength black bin bag on hand if you’re going to walk him (Sidney’s little poo-bags will certainly not be up to snuff). I know, Mr Devine! The black shuck appeared after I developed the photograph, it certainly wasn’t there beforehand…. and isn’t there now. These bottles are mysterious creatures, I am looking forward to seeing where they lead me next. I am also rubbish at working out what is going on with them. Back when I was a youngster in Australia a person who carried a hessian bag and went around picking up beer bottles was called a bottl-o. If you are thinking about going back to the bottles do you have a hessian bag. Hello, Mr John! A hessian bag? Like the ones used in a sack race? I see no harm in acquiring one. I once thought about using hessian to make a sofa cover and matching curtains, but then thought better of it. Obviously I had been spending too much time on Pinterest. YES, PLEASE! MORE BOTTLE STUFF! Mr Lax, I believe Dinah is the recycling Queen of Australia! More bottle stuff it is then! We must know what happens! Ms Mow is so thoughtful and environmentally conscious. A real martyr to her liver! I didn’t have a clue about with the bottles but followed your link on the side bar. Was it an idea that never happened or did you create the bottles but never leave them in public places? Sounds like a cool idea. It is a very, very long story…. over 10,000 words at the last count. If you click the category called ‘bottled’, which should be below this post, then all the related posts will appear… back to front, as is the way with blogs. I will be scattering clues like confetti…. soon! Hello lovely Savvy!! The bottled posts are numerous…. but it’s actually a simple plot with a lot of muddlement 🙂 I might actually remember to send you something this Christmas…. I might start on Christmas in October just to make sure!! I just want to step forward and offer my congratulations to your left eye for letting the water flow when required. Thank you, Mr Ducks…. my left eye deserves a medal…. or perhaps a silk hanky. Should one be embarrassed by the number of empty liquor bottles in one’s recycling bin each week? Dear Mistress, I do enjoy walking the dog on recycling day and counting the number bottles my neighbours put out. Sometimes I am a little miffed that I wasn’t invited to the party. So you’re not going to explain? So you’ve bottled out? I mean, just how did you get a Jack Daniels bottle inside a second bottle? Charmaine is not the only one burning with curiosity. Goodness, Nick, patience please!! I only posted this on 28th September!!! I am considering which plot line to pick up…. I haven’t thought about bottles in a while…by now, my friends know that when it comes to picking out or bringing a bottle of wine for a gathering, it’s a safe bet that I’m choosing a white wine, a Riesling…goes well with any occasion, helping to make friends and bring joy in plenty of situations. I have kept several empty wine bottles…because I like their colors and shapes. I try not to think about bottles, Mr Swings….. mine contain mysterious things. One wonders if it’ll get past the pondering phase or if the pondering is, itself, the art? I will have to ponder your comment, Monsieur Pain, before I do anything else. They used to be on my mantlepiece, Lulu, I was told that if I ever wanted to sell my house I’d have to hide them. I think they used to frighten people. I think you’ll need more than one bottle to get through all those posts…. and then a nice lie down… and possibly some painkillers!!! I have to read it all again…. I have the Ibruprofen ready.